Have you heard this story? A mother nudges her son, who is still in bed, curled on his side with his back to her, on a school day. The alarm was snoozed about 10 minutes ago, permanently, when the plug landed gently on the carpet just 14 inches below the socket from which it was yanked. "Come on! Get up! You'll be late for school," was the encouragement accompanying the nudge. "I don't wanna go to school!" Muffled by blankets, his response didn't need to be clear to be heard. His mother sensed it was coming. Not enough time passed for impatience or anger to build yet. "What's the matter this time?" In a tone expectant of some phony excuse. "I don't wanna go. Nobody likes me. I don't have any friends there. The teachers pick on me behind my back. And to top it off, the school lunch is cold and soggy." His mother grinned silently at the latter comment, but came back with a retort nevertheless. "Okay, I'll pack you a nice lunch, but you're still going to school. I understand. It's a big school and not everyone is going to like everyone else. If you want a friend, be a friend. And don't worry about what the teachers say behind your back. Worry about your own integrity. Besides, they all need you. You're 38 years old and you're the principal! Now get up!" Perspective. Funny how situations are defined by perspectives. If you haven't heard that story, no doubt you expected the son to be a young student. Although intended as a joke here, in real life it's a very sad thing when an adult acts like a child. Growing. Getting older is inevitable, but maturing is not. Perhaps you know of someone like this. Aggravating, isn't it. But, just yelling a command at the person only frustrates you both. So don't concern yourself with changing others. Look to yourself. Are you growing up? Maturity is the result of a deliberate choice to extend effort and focus to become something you're not already. Let's face it, change happens! It is said, "The only constant is change." You either purposely seek it, simply acknowledge it, or deny it. 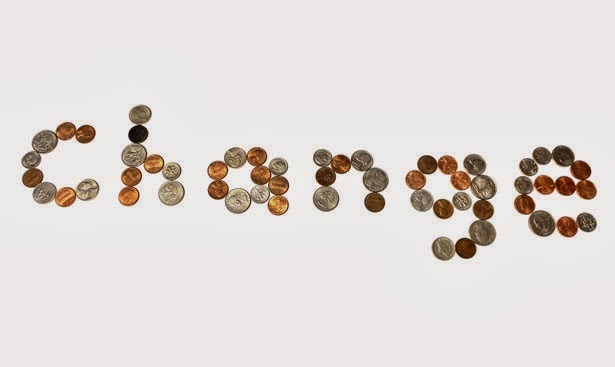 To simply acknowledge change is to be its beneficiary or victim. Your attitude pretty much decides which. Usually, it's a spontaneous attitude of the moment, and it is involuntarily given the power to determine your mood. But, either way it's not often expected. It just happens. We just recognize that it did. To deny change takes effort, but that effort is not at all focused on any good that come as a result of change. In fact, the effort is in pretending things are the same, or that things could go back to the way they were. You will always be the victim in either case. Embrace change. Even seek it. Since change is inevitable, prepare for it. In fact, always be partially preparing, partially adjusting, looking for the good, and being wholly grateful. Embracing change is often a bittersweet journey; to welcome the new is to say goodbye to the old. Welcoming can be sweet, very sweet at times, even joyful, like the birth of a child. Saying goodbye can be bitter, very bitter at times, like grieving the loss of a loved one. But, to really get the sweet part, not just on the surface, you cannot deny the bitter part. Both are deep. Such is life. Do more than accept it. Embrace it. So, wake up! Attend this school called life. Study hard. Learn inward as well as outward. Prepare for quizzes and tests. Participate in extracurricular activities. Take recess once in a while. Be a friend. The world needs you, all of you, whether you're 8, 38, or 98. Live your life like everything about it is a miracle, because it is. As a Christian, I even embrace the death of Christ as a miracle, because He is the propitiation for the sins of the whole world (1 John 2:2). Because of the work He did, and because God raised Him, I'm not only reconciled to God, but God has adopted me as His son (Romans 8:15). Because God loved me so much, and I was willing to turn to Him and see this love (John 3:16, 17:3). I didn't always believe in Him. I had slowly changed my mind about Him as I learned from Him directly from scripture. I had, and still have, an excellent pastor-teacher, but fear not that you won't. I believe when the student is ready, the teacher will come. He rewards those who diligently seek Him (Hebrews 11:6). I stopped looking to man's religion and that's when I started seeing His kingdom and His righteousness. It is a gift of God and all His doing (Ephesians 2:8-9) and wonderful beyond words (Ephesians 3:20-21). For to me, to live is Christ (Philippians 1:21a)! After all,"we know that all things work together for the good of those who love God and are called according to His purpose" (Romans 8:28).